We are expecting the arrival of the IS28 on Friday the 26th April so we should have all the 2 seaters rigged for the weekend. Those that will require a type conversion should arrange it with me beforehand. There is no rush as we are not flying vouchers until the 12th but I would like all Instructors to be fully familiar with it in good time. The modified Pilot check levels have also been posted in the downloads section for ease of access. The good news is that all Club gliders are ready to fly. However we need a rigging Party on site on FRIDAY 26th April. Following a change to BGA procedures involving the Pre-Flight checks I have edited the Flying Orders slightly at 8.1. This allows for delayed closing of the canopy in either misting or very hot conditions, ensuring that the canopy closed and locked check is done before cable attachment and launch. The new Flying Orders for 2019 are on the download page. There is also information about the new radio channels following the change to 8.33kHz channel spacing. Sadly the 2018 soaring season at Skelling Farm has drawn to a close. It was a good year overall with spells of stunningly good weather in the first half followed by a greater than usual number of wave days in the last 2 months. Several new members and above all no accidents. As CFI I thank everyone, member and visitor, alike for their flying this year. We can look forward to 2019 with relish but during our closed season one of our members, Frank Bradley will try to organise some informal trips to other clubs, I welcome this and will personally try to join in if time and othercommitments permit me. Please support Franks initiative. Next week starting the 20th August we will be holding a Junior training week to advance our junior members along their gliding careers. As well as offerring dedicated training we are also giving them the opportunity to bring a friend along for a flight at a much reduced rate during the week Mon to Fri.
Tony Walker who is the Duty Instructor will be running this week and will also be hoping for good weather to maximise the week. He will also be running some low key class room sessions to ensure the theory part of learning to fly is not missed. Earlier this year Andy Jones completed his Silver C with a flight to Gretna and Jon March gained his FI (R) Instructor rating. Kieth Nattress and Mike Dodd went away to The Gliding Centre and obtained there X/C endorsements. 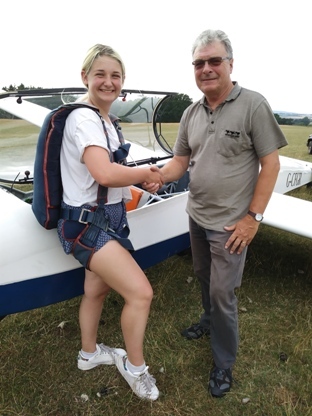 Mike subsequently did the 50 Km and Height gain for Silver C on a flight from Skelling Farm to the seaside at Silloth and on Tuesday he flew for 5 hrs to complete his Silver C.
Fiona Campbell, a 15yr old Junior member was sent Solo afer some intensive training and today also flew on the ridge Solo for the first time. Fiona then did the 1 hour flight required for Bronze. This is becoming a great season! Despite the "unsuitable" winds we have had some excellent soaring conditions. Not bad so far from a small but enthusiastic club. And we are only half way through the season yet.......... more to come I hope.